Getting There :: Sipadan Water Village Resort, Mabul Island, Borneo. 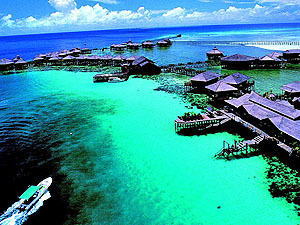 Sipadan Water Village Resort Sdn Bhd (SWV) is one of the pioneer in the development of recreational diving and resort management in Mabul Island. 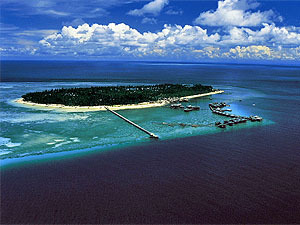 The Governor of Sabah, TYT Yang Dipertua Negeri Sabah Tan Sri Datuk Panglima Haji Sakaran Bin Dandai, officially opened the resort on 29 December 1995. Directs flights between Kota Kinabalu and the regional capitals of Kuala Lumpur, Singapore, Tokyo, Seoul, Taipei, Kaoshiung, Hong Kong, Brunei, Manila, Cebu and other international capitals, make Sabah easily accessible to travellers everywhere. Upon arrival at Kota Kinabalu International airport, travellers then proceed to Tawau airport on the east coast of Sabah.